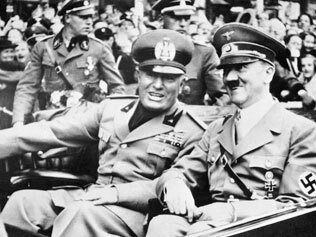 “ITALIAN dictator Benito Mussolini’s blood and brain went on sale for €15,000 ($24,343) on online auction website eBay before the company pulled the ad posted by an anonymous seller. “No bid was made during the brief time the advert was visible,” eBay said on its website, explaining the removal on the grounds that the company did not authorise sales of human matter. “It’s a disgrace trying to sell my grandfather’s brain and blood,” Alessandra Mussolini, the neo-fascist granddaughter of Il Duce, told Sky TG24 television. She said the remains of her grandfather, who was hanged by partisans at the end of World War II, were normally kept in a Milan hospital.”……..
Rasta Livewire wishes to note that Benito Mussolini’s name is stained with the infamy of facism as he was the uncontested father of that evil ideology. Benito Mussolini was so arrogant and deluded that he relished in his title of little Ceasar. He believed he was the reincarnated spirit of some Roman Emperor. He supposedly reinvigorated Italy with his racist philosophy. He turned the Italians into a war-mongering, vain-glorious mis-guided set of reactionaries. Il Duce (as he was also known) helped set the world on the path to second world war. In his delusional fantasy as a reincarnated Ceasar, Il Duce sought to relaunch the glorious banners of the Roman Empire and Africa offerred a great place to commence his adventures. In league with the Pope of the Roman Catholic Church, Benito Mussolini launched an unprovoked attack on Ethiopia in 1935, an attack which was roundly condemned around the world. Paying little heed to the global outrage, Mussolini sought to advance his aim which was the conquest and the creation of an Italian Empire off the shore of the North African coast, in Ethiopia specifically (the only independent African state at that time). The savagery of his attacks were unheard of and unseen previous to his barbaric show. The gas bombs, and the chemical bombs which were flung on hapless Ethiopians by the immoral soldiers of Mussolini’s Italy were blessed by the Pope of the Roman Catholic Church (Pope Pius IX). The attacks led to the exile of Haile Selassie, and his famous pronouncement of Judgement in the Halls of the League of Nations, on the godless European tribes who were in quiet collusion with the Italian agenda, even though hypocritically critical of it in public arena. And the judgement was that just like Europe had plotted to rain bombs on Ethiopia, so would bombs rain on Europe; and just as the Kings of Ethiopia would be returning from their exile, the sons of the Kings of Europe would be running in fear, panic and desperation, into an exile that would be rather long in its endurement. Yet, the designs against Ethiopia all failed. By the mights of his Imperial Majesty, working in the spirit and power of the holy trinity, Emperor Haile Selassie was able to defeat the wicked pan-European designs against the notion of an independent black nation. Hence freedom was enshrined and it was built into the charters of the United Nations Organization, the principles of inviolability of the soveriegnty of any nation or people, by another nation or people without the consideration and authoriazation of the United Nation Organization. Not only did the designs fail, the implications and the revebrations of those violations wrought by Italy lead indirectly to the begginning of the second world war just as Emperor Haile Selassie had warned Europeans when he stood before them in the halls of the League of Nations. The facists and the Nazis stood together shoulder to shoulder durining the second world war, and they fell together to the combined forces of the outraged and long-suffering world. Hitler supposedly committed suicide and Mussolini his compradre was hung like a common criminal by his own comrades. Mussolini’s blood was said to have flown on the pavement of the square where he was hung and dogs stopped by to lap and lick at the blood. The end of the notorious gangster Mussolini would not have been any more poetic, in the end. The blood and bones of all the innocent Ethiopians he had killed without cause overwhelmed him and slayed him like a mongrel dog right in the heart of his pretend Imperium,. But today, the indignities that followed this human reject continues. The visitations are wrought by the same hands of his tribal grouping whose cause he supposedly came to champion. Proving that a lost cause is forever unsalvagable. Mussolini’s brain was pretty much rotted by syphillis. I don’t know what Hitler’s excuse was. It was Pius XI, not Pius IX. In 1939, they got Pius XII, who was known as “Hitler’s Pope”.